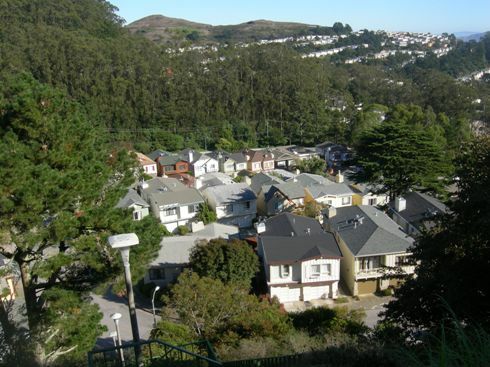 One of the most delightful aspects of our neighborhood – besides the wonderful forest – are its romantic stairways, climbing the steep slopes of Mount Sutro and linking the roads. What surprised me was that they all have names. 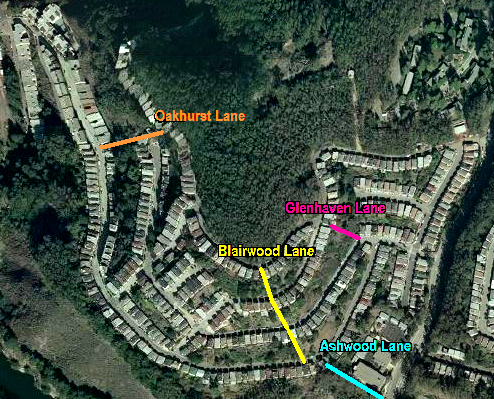 They’re lanes: Ashwood Lane; Blairwood Lane; Glenhaven Lane; and Oakhurst Lane. The stairways are all in flights of around 100 -200 steps, though some are actually systems of several flights of stairs. The shortest stairways are Ashwood Lane, which connects Clarendon Avenue to Warren Drive, (109 steps), and Glenhaven Lane, connecting Oak Park Drive to Christopher/ Crestmont (167 steps). The two longer stairways are Oakhurst and Blairwood. Oakhurst runs from Warren Drive to a cul-de-sac on Oak Park (162 steps) and up to Crestmont (another 193 steps) for a total of 355 steps. And our own neighbor Beverly Mack wrote “Steppin’ Up” in the Jan 2010 issue of the Forest Knolls Neighborhood Organization newsletter, about the benefits of the stairs as a real-life exercise machine. Here’s the article (published with permission and edited to avoid duplication — all the step-counts above are from that article). We are fortunate to have stairways that connect our neighborhood streets as an immediate source for exercise. The advantage of having the stairs is that you do not have to drive to the gym – no gas, no traffic, and no parking problems. The stairs are available 24 hours a day, seven days a week, with no closures because of holidays. And above all else, IT IS FREE. So, let’s start exercising by stair climbing. Take your dog, children, grab a neighbor, or better yet start a group. Stair climbing uses your quads (front of your thighs) and buttocks. It is an intense exercise because you are carrying your body weight against gravity. It is an intense cardiovascular and leg muscle activity. And it is low impact and safe for your knees. Do not do too much too quickly, and be sure to consult your orthopedist if you have existing knee problems. There is stress to your knees coming down stairs rather than climbing up, so when you reach the top of any level, walk back down along the sidewalks of our Forest Knolls streets. Depending on your body weight and pace, stair climbing can burn 300 calories in 30 minutes. Make sure to wear shoes with good support. Drink enough water before, during and after your workout. Think about alternating stair climbing with other activities, such as taking a walk in our great forest. Whatever you do, make sure to check with your physician. Start slowly, wear supportive shoes, drink water, and don’t forget to stretch before and after exercising. Above all have fun. And besides, it’s a great way to meet your neighbors. Thanks for posting the information and “names” of our stairways! I have been enjoying most of the stairways for the past 4-5 years not knowing they had names. The first year using them I noticed the over grown weeds, roses, branches, and what not. 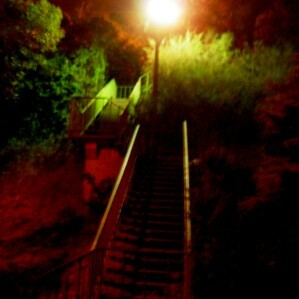 I have put count-less hours in pruning back, trying to keep the stairs and handrails clean. It is a great way to get a “fast” work-out breathing in fresh air seeing our beautifuI neighborhood. Hiking up or down is always fun!